A tem­per­a­ture track­ing device, also known as Tem­per­a­ture Data Log­gers, is a device used to mea­sure the tem­per­a­ture of prod­ucts dur­ing the man­u­fac­tur­ing process, along the ship­ping and dis­tri­b­u­tion or in ware­hous­es, fridges & freez­ers. From stor­age to ship­ping, it’s impor­tant to mon­i­tor the tem­per­a­ture of goods to ensure that the cold sup­ply chain remain unbro­ken. Also, to make sure the goods have been stored in opti­mal con­di­tions. For this rea­son, tem­per­a­ture data log­gers can ensure the fresh­ness and qual­i­ty of the goods. There­fore, for cold sup­ply chain mon­i­tor­ing, CAPLINQ offers the per­fect low cost and reli­able solu­tion: Smartlinq Sin­gle-Use 90 Day USB Tem­per­a­ture Data Log­gers. CAPLINQ Smartlinq is very sim­ple to use. First of all, once arrived, your cus­tomer sim­ply press­es and holds the device for 5 more sec­onds to stop the log­ger. Then, your cus­tomer opens the plas­tic pack­ag­ing and plugs the USB dri­ve into any com­put­er. The entire tem­per­a­ture his­to­ry is pro­vid­ed in a PDF Report. Fur­ther­more CAPLINQ Smartlinq is a low cost tem­per­a­ture log­ger when com­pared to sim­i­lar prod­ucts, but with the same high qual­i­ty and reli­able report. Also, the pack­age is a mois­ture-resis­tant plas­tic. Thus, keep­ing the elec­tron­ics safe from humid­i­ty until it has safe­ly arrived at its des­ti­na­tion. 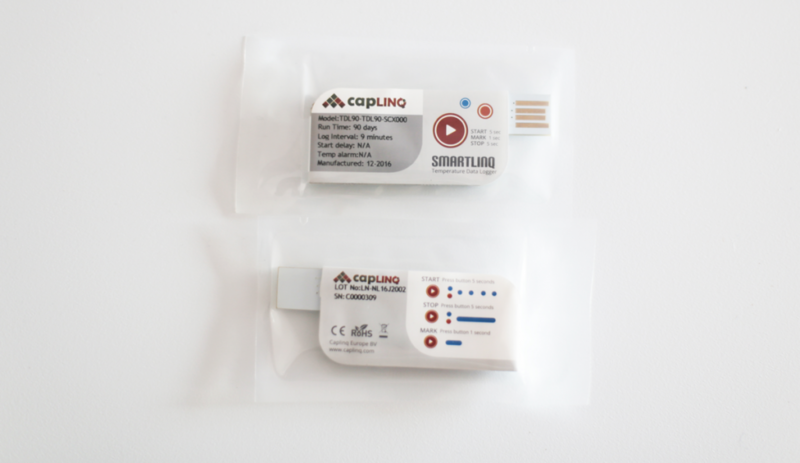 With loca­tions on three con­ti­nents, CAPLINQ can dis­trib­ute the Smartlinq TDL90 tem­per­a­ture log­gers to your loca­tion with­in just a few days. If you need fur­ther infor­ma­tion, please click for more details on Smartlinq Sin­gle-Use 90 Day USB Tem­per­a­ture Data Log­gers. You can also vis­it our web­site to learn more about data log­gers, indi­ca­tors & pack­ag­ing. Should you have ques­tions, or require more infor­ma­tion, please feel free to con­tact us.